You will race to sequence the paper boxes labeled with HTML tags, becoming familiar with the most common HTML tags and learn how to structure a web page, code, and remix. 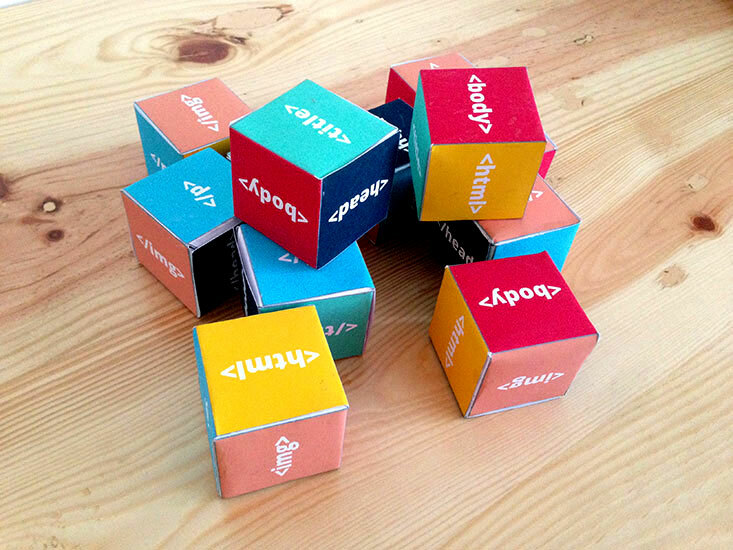 Printed HTML Puzzle Boxes on thick paper. 12 copies minimum. Assemble paper HTML puzzle blocks. Stack the blocks to model the structure of a webage. Review the HTML tags on the blocks. Print at least 12 copies of the Puzzle Box pattern. Creating one Puzzle Box is pretty easy. But, to have enough Puzzle Boxes to play the game, you will need at least 12 boxes – to ensure that you have enough boxes for opening and closing tags. In total, for a pair of players, you need to build 24 boxes. So, to build all 24 boxes, you need to print 12 sheets of the papercraft pattern. It is preferable to print the Puzzle Box with thick paper, so it will be easier to assemble and will have a better build. If you are limited on time, you can do this activity by writing on pieces of paper or post-its instead of making boxes. This is a pretty fun but time-intensive thing. Learners first assemble their boxes. Bonus: If time permits, mentor plays HTML Corners using the boxes to signal the stations. First assemble the tags in the right order in a small group. You can model this build for the whole group. Then have learners or groups take down their boxes and "scramble" them up in front of them. Tell participants that their new goal is to stack the blocks into the correct order for building a webpage. Then let them race to see who can build a webpage the fastest! This is the right combination of HTML tags structure. Repeat the HTML Corners game if time permits. You can also just have learners shout out what each tag means. Bonus: If time permits, show the tags in action by clicking "View Source" or using the X-Ray Goggles on a webpage. Bonus: Tag your environment by putting remixed HTML Puzzle Boxes or post-it notes around the room a la Markup Mixer. That is to say, create tags for the objects in your room, like <door> and <door> and then put them before and after the objects they describe to mark-up the room as if it was a webpage. Conclude by asking the group to reflect on what they found. You will race to sequence the paper boxes labeled with HTML tags, becoming familiar with the most common HTML tags and learning how to structure a web page and how to code and remix. Print a copy of the HTML Puzzle Boxes to do this activity. Order your HTML tags correctly to complete the simple structure of a webpage. Upload a photo of your HTML Puzzle Blocks in the correct sequence and of the code written on Thimble. The skills that you have learned through this activity can be recognized and validated by earning credentials or badges. Through a partnership with the Open Badges Academy (OBA), you can earn over 15 Web Literacy and 21st Century Skills credentials or badges. Once you earn them, you can share the credentials/badges via your social media or resume or use them to connect with others. If you are interested in applying for badges, visit the OBA and/or reach out to Matt Rogers or DigitalMe to schedule a demonstration.